Below are some details of the known farms around the hamlet of Ascott and east of Wing, their owners, and tenant families. If you have further information to add, please let me know. Waterloo Farm to the north of Leighton Road was the home of the PRENTICE family. It had been renamed Waterloo Farm in the 1860s, and was previously recorded as Ascott Field Farm in the 1851 census, Tolegate in 1841, Bedlam Farm on the 1820s Bryant’s map held at the Centre for Buckinghamshire Studies, and just Ascot Farm in 1818 when John Prentis and older brother Thomas insured it with Sun Insurance. The two brothers are both recorded as farmers in the 1798 Posse Comitatus, John with 7 horses and 3 carts. Thomas and John were tenant farmers to Lord Chesterfield, and the property tax was assessed at £16 15s 8 ¼ in 1820. It’s not clear whether Thomas had died or simply moved away in the 1820s, but John seems to have taken over the farm as subsequent records all just mention John. 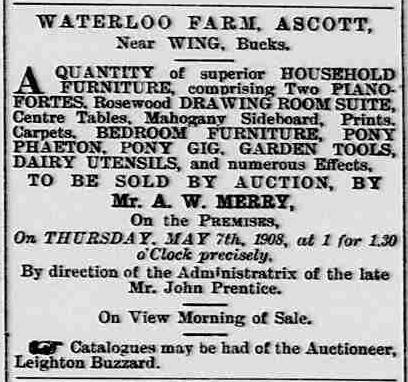 In the 1826 jury list he’s recorded as a farmer of Ascott Field, and his status as tenant rather than owner is implied by his “poor rate” notation. John’s youngest son, also named John, gave his birthplace as Waterloo Farm when completing the 1891 census at age 61 so the family were living there in 1830, and also appear there in the 1841 census. After John senr’s death in 1846 his widow Martha took over running the farm – John junr was just 16 and a bit too young for the task. The family’s eldest son, Thomas, was 30 but appears to have been separately established as farmer/vitualler living at the Red Lion, Ascott, in 1851. In the 1851 census Waterloo Farm was recorded as being 189 acres and employing 8 labourers. Upon Martha’s death in 1866 John junr (pictured below) continued. He was still living on the farm but noted as a retired farmer on the probate index when he died in 1908. This brought an end to the Prentice association with Waterloo Farm, as John never married and had no family to pass the farm on to. A few employees of Waterloo Farm are mentioned in newspaper reports. In August 1865 farmboy Seth DENCHFIELD is noted as having accidentally stabbed himself in the thigh while shearing a sheep. In March 1893, William MORGAN is reported as being John’s gameekeeper in a prosecution brought against local labourer John Bull for setting snares on the farm. In 1907, the year before John Prentice junr died, Heley E FREESTONE is also listed as a farmer at Waterloo (as is John), but it’s possible Heley was not resident on the farm or even in Wing as he does not appear on the 1911 census, despite still being listed as a farmer at Waterloo in that year’s directory and the 1915 directory. Instead, Thomas J RAWLINS is resident there in the 1911 census. Lionel CARTER and Herbert Lionel SYRATT appear as smallholders at Waterloo Farm in the 1924, 1928, 1931, 1935 and 1939 directories. In the 1924 Kelly’s directory Waterloo Farm is shown as still being over 150 acres. 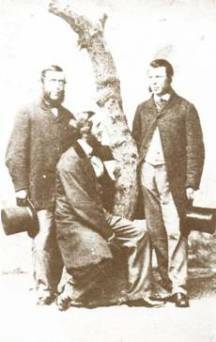 John Prentice of Waterloo Farm to the left, Philip Hart of Ascott Farm to the right, in the 1860s. Picture taken from Wing As It Was vol 2. Ascott Farm (on the current OS map as Ascott Home Farm) is part of the wider Ascott Estate. In the first part of the 19th century it was farmed by the HART family. A Mr HART of Wing provided information about his then-290-acre farm which was reported in General View of the Agriculture of Buckinghamshire, published in 1813 but relying on accounts from up to five years earlier. From this we learn he keeps 30 cows and 12 hogs in summer, porkers in winter, 120-140 sheep,and 16 horses. He does not have much luck breeding stock, and instead buys in heifers for the dairy (likely following the norm of buying at four years and selling at eight). Crops grown in rotation are turnips (unless the land is too heavy for turnips), barley, clover, wheat and peas or beans. This Mr Hart must have been the predecessor (father?) to Thomas HART who is listed in the parish registers from 1824 as an Ascot farmer baptising his children. Thomas wore many hats, valuer, land agent and auctioneer as well as farmer, and is occupant of Ascott Farm in the 1841, 1851 and 1861 census records and corresponding directories to 1864. The 1851 census records the farm as being 422 acres and employing 18 labourers. In the 1863 Duttons directory the listing is for Thomas Hart and Sons – these sons included his eldest son Philip HART (pictured to the right) who appears to have farmed alone at Ascott Farm after Thomas’s death in 1865 (his effects were “less than £16,000”, a significant sum) through to around 1873, and thereafter farmed (and owned) other land in Ascott. One employee of the HART family was Thomas STURNHAM who was reported in the Leighton Buzzard Observer of 3 May 1864 as having severely injured his heel. The ROTHSCHILD family first purchased land in Ascott in 1869, followed by the major Ascott estate purchase in 1873, and from this point this farm was in the hands of Leopold de Rothschild’s bailiffs – Richard WEBBER in 1891, William WATSON in 1895 and onwards until at least 1915, then Walter E WATSON by 1924 and on until at least 1939 (I can’t find any sign of William having a son of this name, so I’m not sure if William and Walter were related or not). By 1928 the property had acquired a telephone (TN Wing 11). 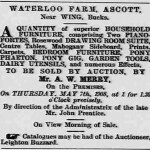 Note that the 1877 directory for Wing names this property as having been restored and enlarged to become Leopold’s hunting cottage, however it is clear from later directories that the property in question is actually Ascott House, not Ascott Farm. Wing Park Farm, also known as Ascott Park Farm, was situated between Ascott House and Wing proper hence the alternative names for the farm and the eventual shortening to just Park Farm. It was created as a deer park by the DORMER family in the 16th century and the open fields used for grazing cattle in more recent times bear little resemblance to the original wooded hills. One early farmer here, having leased the land from the Earl of Carnarvon (Charles Lord Dormer), was William BISHOP who died in January 1692/3 (I have a copy of his will, and there is also an inventory list in PROB 4/9583, mislabelled as 1673 rather than 1693, at The National Archives). Jumping to the early 19th century, Thomas ROBBINS held fire insurance for Wing Park Farm in 1818. However it is the GATES family that had an enduring connection to the property. The family came to Wing from neighbouring Aston Abbots in the late 1840s. John GATES was the proprietor at the time of the 1851 census, when the farm encompassed 322 acres and employed 9 labourers. He also appears in the directories 1853 to 1864 as a farmer at Ascott (and also as proprietor of the Royal Oak, which stood up at the intersection of Well Lane with Leighton Road), and as a cattle dealer – the farm’s specialisation was cows, most notably grazing Devon cattle for market. By the 1861 census the farm is recorded as Wing Park Farm rather than Ascott Park Farm, and John is listed through to the 1881 census (he died later that year), and in directories to 1877. The GATES family owned the land by this point, as John is recorded in the 1873 owners of land listings as owning 296 acres 3 rods 18 perches worth £714 18s. John died at Wing Park in 1881, leaving an estate of £69,000. His son Baron Frederick John GATES (Baron being a family forename rather than a title) inherits Wing Park and appears in the 1883 through to 1915 directories. It seems that during Baron’s tenure he actually lived in neighbouring house Ascott Lodge (see below) while the house at Park Farm was occupied by ag lab (later farm bailiff) William TUFFNEY and his family (as seen in the 1891 to 1911 census). After Baron Frederick John GATES’ death in 1921 (leaving an estate of £96,000), another Baron John GATES, likely the one formerly farming to the south of Wing at Upper Wingbury, takes over. I’m not entirely sure who this was though – too many Baron GATES in the extended family but too few of them alive and of an appropriate age! The mystery Baron John GATES appears in the later 1924 to 1928 directories – the farm is still over 150 acres in 1924. The farm is not listed in the directories of the 1930s until 1939 when William Morris is listed as farming at Wing Park. Ascott Lodge was part of Wing Park Farm, rather than a separate farm. In 1692, William BISHOP bequeaths his household assets from his home the “Lodge House at Wing Park”. The Lodge’s 19th century occupant Baron Frederick John GATES (in the 1881 census and directories in the 1880s) is simultaneously listed as a farmer for Wing Park Farm and farmer/resident of Ascott Lodge. Joseph BRANDON is listed as farmer/grazier in the 1851 (20 acres, 1 labourer), 1871 and directories from 1854. He died in 1874 and his young son also named Joseph took over and appears in the 1881 census plus directories to 1883. Joseph senr’s original line of work was as a farrier blacksmith, but this evidently evolved into dairyman as that is his stated occupation in the probate index. Mrs Eliza FOUNTAINE is listed in the 1854 directory as a grazier at Ascott. However the FOUNTAINE family’s main association was with Lower Wingbury Farm to the south of Wing, rather than Ascott. John SMITH as listed in the 1851 census as a farmer of 93 acres employing 7 labourers in Ascott.